If you're thinking of getting financing for a home improvement project or a special vacation, you can use a home equity line of credit (HELOC) to fund your dreams. A HELOC allows you to borrow money by using your home's equity as collateral. Your lender sets a borrowing limit, and you can choose to borrow as much of that as you want for an agreed-upon period of time. It’s similar to a credit card or business line of credit, in that you withdraw money as you need it and only pay for what you borrow. In a home equity loan, a lender gives you one lump sum and you make the same payment every month until the loan is paid off. A line of credit differs in that it’s revolving, meaning you can use the money, pay it off, and use it again. A home equity loan also comes with a fixed interest rate, whereas a HELOC has a variable rate. One of the main requirements for qualifying for a home equity line of credit is having enough equity in the home. Banks require that you maintain 10 to 20 percent equity in your financed home at all times, even after you take out a home equity line of credit. In order to qualify, borrowers typically need substantial equity in their home. Other requirements of a HELOC include proof of income, steady employment, and a good credit score, typically above 680. Suppose you purchased your home for $210,000 and have paid off $100,000. For simplicity's sake, the house is still worth $210,000, leaving you with $100,000 in equity. Assuming the bank requires you to maintain a 20 percent loan-to-value ratio, meaning you could get a HELOC for $100,000 minus 20 percent of your home's total value of $210,000. This works out to ($210,000 x 20 percent = $42,000) that the bank won't lend on, leaving you with a potential HELOC of $58,000. Is a Standard Loan Right for You? First and foremost, be clear on what you want to do with the money. 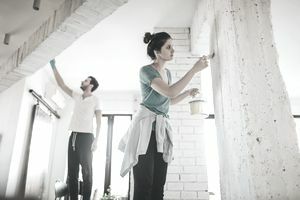 If you’re looking to do home renovations, a common reason for getting a HELOC, a standard home equity loan could be a better fit. A loan would give you one lump sum, allowing you to complete your renovations and pay the loan back in a straightforward manner. A line of credit allows you to repeatedly pay down and re-borrow, just like a credit card. Though the interest is typically much lower than on a credit card, it could still be dangerous if you’re constantly borrowing and repaying, without keeping tabs on the total amount used. In other words, you don’t want to get in over your head. If you’re looking to consolidate debt by paying off high-interest credit cards, a home equity loan might be a good choice since you'll get fixed monthly payments. Get the money, pay off the cards immediately, and start making your payments to the bank at a lower rate. While a HELOC can do the same thing, as you pay off the HELOC the money becomes available again. For some, this money is tempting and can put them back in debt, exactly where they started. On the other hand, a HELOC might be your best bet if you are paying for a child’s college tuition. Tuition is a revolving bill, which is a scenario where a HELOC makes sense. Pay the tuition at the start of the semester, pay off the amount, and then repeat next semester. For some borrowers, tax benefits make HELOCs and home equity loans are more affordable, as the interest you pay on these loans could be tax-deductible. Speak with a tax preparer to find out the requirements and how to take any deductions. You might need to itemize, and there are limits including, among others, limiting interest charges on debt up to $100,000. Details are available in IRS Publication 936. Can you save up for it instead of relying on a loan? Can you afford the worst-case-scenario payment or the one at a high interest rate? Will you be tempted to use the money carelessly? What is your plan to pay off the debt? Remember that your home is being used as collateral. If you fall on hard times for any reason, such as an unexpected job loss or medical expenses, you risk losing your home if you can't make payments on your loan. You might also have problems selling your home due to an additional lien being placed on the property. Ultimately, only you can decide if a HELOC is right for you. Make sure you fully understand the fees, terms, and conditions of the line of credit. It’s still a debt and should be taken seriously. Consider whether there’s an option available to achieve your financial goal that doesn’t require debt, such as picking up a part-time job to earn extra money.